The authority that licensed the lion trophy hunt which became the focus of a parliamentary inquiry last week has been at pains to assure everyone it was not the pride male named Skye. It seems to have just scored an own goal. It was the wrong picture and probably the wrong dead lion. The Mpumalanga authority, which licensed the Umbabat Reserve trophy hunt, showed Parliament two pictures last week. The live one, they said, was Skye, but it definitely wasn’t. The dead one, they said, was the hunted lion and not Skye, but its markings indicate that it most likely was. 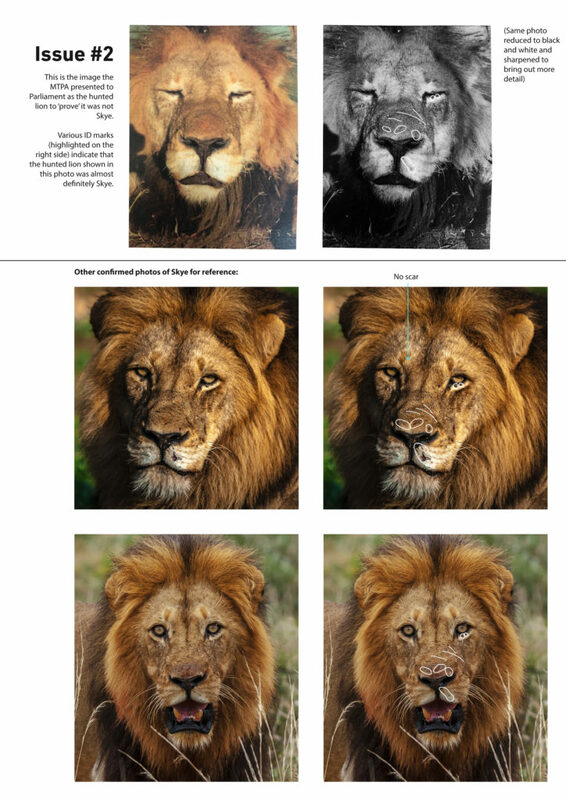 A high-definition rendering of Skye – who was often photographed by tourists – and the dead lion show the same distinctive marks below the left eye and the same nose scratches. 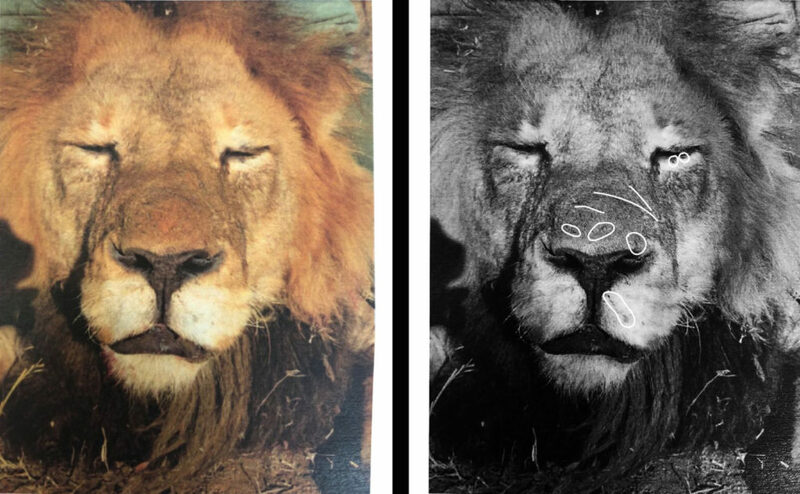 Analysing facial scars and eye markings on the picture presented to Parliament, Jason Turner, an independent ecologist with 20 years experience in identifying lions, found the facial markings on the dead lion to be “identical with those of the pride male named Skye”. A land owner within Umbabat, Charlie Lynam, who has followed and photographed Skye over many years, confirmed this. 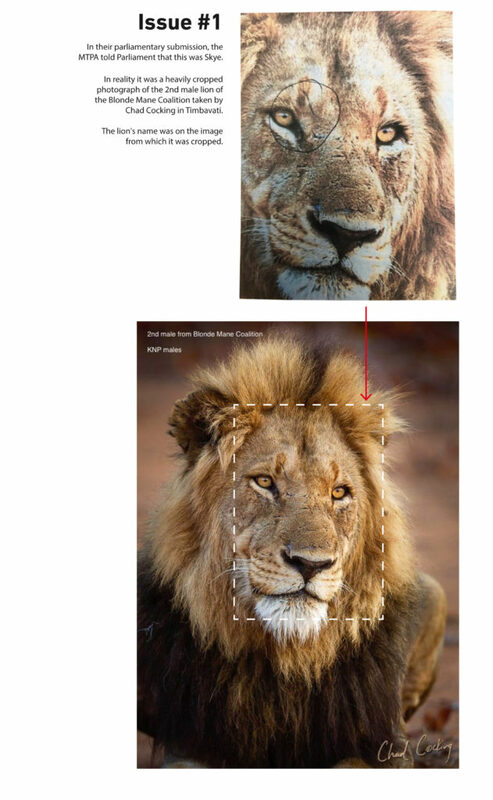 “The photograph of the dead lion does appear to be of Skye as it bears a number of his definitive and unique identification characteristics such as nose and eye scars,” Lynam said. The photographer and ranger, Chad Cocking, whose image MTPA used claiming it was of Skye, said the lion pictured was part of a known coalition of two males in the eastern part of what was then Tanda Tula’s traversing concession. The Ingwelala board issued a statement saying the dead lion was not Skye. Skye did have a broken tooth, but was in magnificent shape. And it has been asked why a hunter would pay over a million rand to hunt a toothless old lion. The board, too, was presumably not permitted to see the carcass. Was their assessment based on the “wrong” photographs that turned up in Parliament? Following the board’s weak-kneed response to Umbabat’s hunting fraternity, its chairperson resigned in disgust. When one of the specialists on the Task Team set up by the Ingwelala Board to investigate the hunt was refused access to the hunt photographs, he resigned in protest. There is mounting clamour about this lion hunt. International attention is growing and reference is being made to the bow-hunting of Cecil the Lion in Hwange, Zimbabwe in 2015, which occasioned a worldwide cascade of disgust. 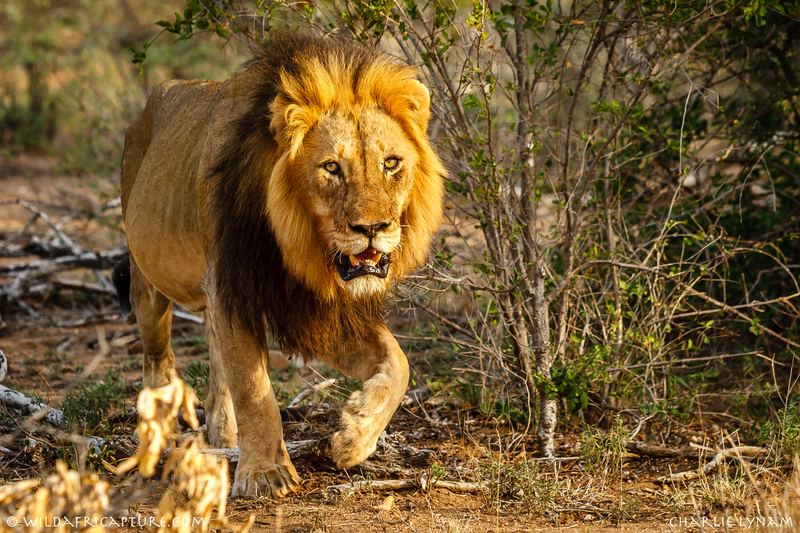 The hunting of the Umbabat lion has also catalysed a rethink about the relation of Kruger Park and private reserves along its western boundary. It was investigated at a two-day Parliamentary colloquium in August and at another inquiry by the Portfolio Committee on Environmental Affairs last week. The committee chairperson, Phillemon Mapulane, said discussions needed to take place around the current protocol that allows hunting of animals in the Greater Kruger National Park’s open system after the removal of fences between the Kruger and the APNR. Noting that the dead lion was baited, the committee also stated that “baiting as a form of hunting of TOPS-listed species should cease immediately”. In a submission to the colloquium, Umbabat and the MTPA were accused of ducking and diving about the lion hunt, which they hotly denied at the hearing last week. But they’ve been unwilling to allow independent verification of the hunted lion’s carcass, saying “it belongs to the hunter and needs his permission”. They also disallowed sight of the hunt report which would include detailed pictures of the hunted lion. When a copy of the permit was demanded, only a redacted copy was supplied with names deleted. Skye has a double moon brand on his right flank, so an in-situ ID would be easy. Refusal has fuelled speculation. The submission of incorrect photographs to Parliament simply adds to suspicion that they have something to hide. Given the questions around the veracity of the pictures presented to Parliament, questions must now be asked about the authenticity of the photographic evidence upon which the Umbabat Reserve representative, Kruger Park, the DEA and the MTPA based their assurances that Skye was not shot. At any hunt, hundreds of pictures are generally taken, but all Parliament was shown (and the only photo ever made public) was a slightly blurred face. Most decent cameras take images in RAW format which cannot be altered and which contain metadata of time and often location of the photograph. No such images were provided to Parliament but should now be demanded. Before the hunt, the Umbabat warden, Brian Havermann, was given clear photographs of Skye and promised Ingwelala that this lion would not be hunted. During the days that followed, a concerned Ingwelala member continued to supply Havemann with information about the location of Skye and his pride in good faith to ensure he was not shot. In retrospect, this may have aided the hunters to locate and kill him.